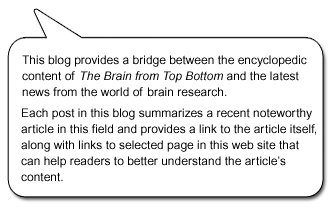 The Brain from Top to Bottom Blog – Beginner Level » Are crows just as good at planning as the great apes? Over the years, many studies have been published on the intelligence of crows, ravens, jays and other corvids (members of the crow family). 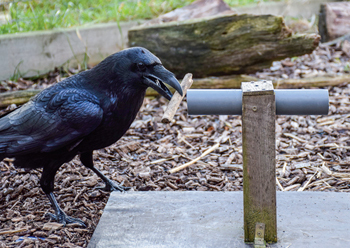 But according to several specialists on the subject, a study entitled “Ravens parallel great apes in flexible planning for tool-use and bartering,” published in July 2017 in the journal Science, reveals that birds in this family have a heretofore unexpected ability to plan a future behaviour after learning something under experimental conditions. The conditions in this study were such that the behaviour was unlikely to have arisen from a more or less innate adaptation to the birds’ natural environment. The ravens learned to use a rock to get a piece of food out of a box built by humans—certainly not a natural feature of the ecological niche in which their species evolved. Nevertheless, once they had learned this behaviour, they were able to select the rock out of a group of objects, then wait for as many as 17 minutes for the researchers to show them the box again, and then use the rock to get the food out of the box. Previously, this kind of behaviour that is associated with planning had been observed only in adult primates and in humans starting at about age 4. If subsequent studies successfully demonstrate that this behaviour is indeed planning (and not simply associative learning, as some critics have claimed), it could mean that this kind of behavioural flexibility may have evolved independently at various times in the course of evolution, and not only in primates, as was previously believed. And if that is indeed the case, what is especially interesting is that both corvids and primates have very rich, complex social lives, in which the ability to decipher other individuals’ future behaviours (and hence their states of mind) is of great importance. Ravens, for example, form groups of many individuals that stay together for several years before pairing off and establishing breeding territories. Also, being scavengers, they have been subject to strong evolutionary pressures to find ways of managing their rare finds of dead animals effectively, such as by hiding them more quickly if they feel that other birds are watching, as was shown in a study published in 2016. In other words, we already had numerous theories that cited social interactions to explain the rapid development of human intelligence during hominization. Now we have some indications that the same evolutionary pressures arising from life in organized groups may have fostered corvids’ surprising cognitive capacities. All of this reduces the so-called specificity of human intelligence just a bit further. But there is still a big difference between a crow’s brain, with about 2 billion neurons, and a human brain, with about 86 billion.